REFURBISHED / REMANUFACTURED TO LIKE NEW CONDITION.. Factory Refurbished units are NOT old worn-out products that have been rebuilt. Generally, they were simply adjusted out of working range by the installer. Since these products may show signs of a previous installation, our policy is not to sell them as new. Rather than scrapping them, we are making them directly available to the public. Not only does this help us control the costs, but it allows you to get a great deal on a like-new product! Factory Refurbished products have undergone a thorough inspection. Any damaged parts that would affect performance have been replaced and tested to ensure performance. Factory Refurbished products have limited availability. Scroll Down for Complete Vehicle Fitment List. This product is not for sale or use on pollution controlled vehicles in the State of California. Upgrade your horsepower in minutes with our inTune i2 Power Programmer. It is easy to install and plugs right into your vehicles OBD-II port. Our tuning team maps out all of the i2s tunes for your exact car or truck. Our goal is to make the biggest power gain, with the largest choice of performance options. The i2 features the latest electronics too; find out more about what makes the i2 the best handheld tuner available today! AN EASY CAMARO PERFORMANCE UPGRADE. Whether you have a Gen 4 or Gen 5 Camaro, the i2 has tons of options for making power! Right out of the box, the i2 will enhance your drivability by removing torque management and increasing throttle response. The low-end torque and horsepower will make it feel like it is brand new again! If you have aftermarket parts installed, you can tweak to your hearts content- disable DoD/AFM, adjust fan temps for thermostats, raise rev limiters, take of the speed limiter, plus get custom tunes for any combination of mods you can imagine! InTune i2 Programmer Key Camaro Tuning Features. Add up to 20 HP, Add up to 20 TQ. Raise Speed & Rev Limits. Capture Your Corvettes True Performance. The Corvette is one of the most amazing cars ever made, and the inTune i2 truly makes it come alive! It gets your Corvette an instant increase in power while enhancing drivability. The preloaded tunes reduce torque management, juice up throttle response, and add a significant amount of horsepower over stock. If you installed aftermarket performance upgrades, you also have options to adjust spark, fuel, idle RPM, disable DoD/AFM, and heaps of other performance options. The inTune i2 is an awesome DIY performance upgrade for your Corvette that you can install in your own driveway! InTune i2 Programmer Key Corvette Tuning Features. Add 15-30 HP, Add 15-20 TQ. Get custom tunes for aftermarket mods. Advanced Data Logging & Data Streaming to PC. The Most Powerful Tuner for GM Trucks & SUVs. The new i2 tuner can make your truck feel brand new all over again! It has tuning options for power or mileage, and a new Easy Tune mode that walks you through the whole process. The tunes will tweak your trucks throttle response, enhance towing performance, and increase your fuel economy without even getting your hands dirty! Whether you just want to put a quick tune on your truck, change your tires, Disable DoD/AFM, or even custom tune it for other performance mods, the inTune i2 is the perfect performance upgrade for your GM truck or SUV! InTune i2 Programmer GM Truck & SUV Tuning Features. Add 15-30 HP, 20-30 TQ. Calibrate Speedo for Larger Tires. There is nothing like a diesel when it comes to making real power and the i2 programmer will become your trucks perfect companion. 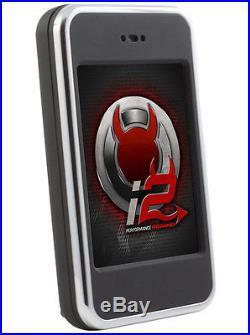 The i2 programmers diesel options let you go from mild to extreme. There is a setting for towing, fuel economy, and high performance all tailored to what you need out of your tuner. Using the i2, you can expect power gains of 80 horsepower or more, and fuel economy gains of 2-4 MPG. InTune i2 Programmer Key Duramax Diesel Tuning Features. Add up to 100 HP, 200 TQ. Tried and True Ecotec Turbo Tunes. TUNING FOR Buick Encore, Cadillac ATS, CTS, Chevy Trax & Sonic. Tune up your 1.4L T or 2.0L T GM Ecotec power plant with the i2 programmer and get thrown back in your seat! When we set out to tune the Ecotec motors, we had one goal in mind. The i2s performance tunes ensure a more responsive throttle, better shift feel, and more horsepower than your ride came with from the factory. Whether you have an Encore, ATS, CTS, Trax or Sonic the i2 programmer is going to make your vehicle feel brand new all over again! InTune i2 Programmer Key Ecotec Turbo Vehicle Tuning Features. Add 30+ HP, add 30+ TQ. Add Power to Other GM Vehicles. TUNING FOR 99-15 Cadillac, Pontiac, & OTHER GM Vehicles. Over the years, we have had the pleasure of tuning more than just Camaros, Corvettes and trucks. GM owners from around the world requested tuning support for a wide range of vehicles, and we answered with solid performance gains. 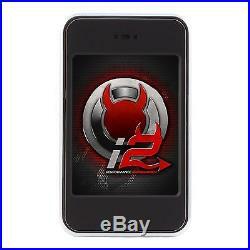 The i2 programmer offers support for vehicles like the Pontiac GTO, G8, Impala SS, Trailblazer SS, Hummer, and more. InTune i2 Programmer Key GM Vehicle Tuning Features. Horsepower and torque gains vary by vehicle year, make, model, and engine. Select your vehicle from our vehicle finder to get specific horsepower gains for your vehicle. Full inTune i2030 Application List Below. The item "Refurb DiabloSport Intune i2 Programmer Tuner i2030 Chevy Tahoe GMC Yukon Models" is in sale since Wednesday, October 19, 2016. This item is in the category "eBay Motors\Parts & Accessories\Car & Truck Parts\Computer, Chip, Cruise Control\Performance Chips". The seller is "powerteqperformance" and is located in Ogden, Utah. This item can be shipped to United States, Canada.